This is a tasty soup, fit for any occasion. Melt the tablespoon of butter in a heavy-bottomed saucepan set over a medium heat. Add the onions and cook for 3 to 4 minutes, until softened. Add the potatoes and cook for a further 10 minutes. Add the carrots and stock, bring to a simmer and continue to cook for 10 minutes, until all the veg are soft. Liquidise with a stick blender until smooth and keep warm. To make the brown butter, put the 60g of butter in a separate pan and melt over a medium heat until it stops foaming and turns a dark golden brown. Remove the pan from the heat and add the hazelnuts and garlic. Let the butter cool, then remove the garlic. 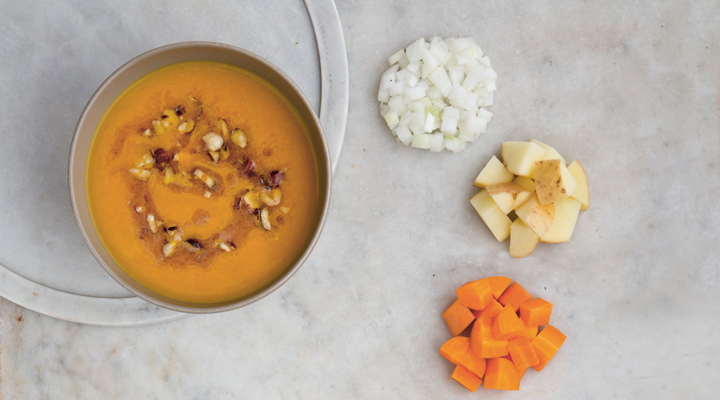 To serve, ladle the soup into bowls and drizzle over hazelnuts and brown butter.